Should you invest in ELSS funds beyond the 80C limit? ELSS funds are special equity funds which enjoy tax exemption on the investment amount, gains and final amount (so EEE regime) up to a limit of RS 1.5 lakhs under section 80C of the Income Tax Act. However, ELSS is not the only investment eligible for Section 80C deduction. We examine the performance of ELSS funds to answer the question whether they make good investments beyond the 80 C limit. ELSS funds are special equity funds which enjoy tax exemption on the investment amount, gains and final amount (so EEE regime) up to a limit of RS 1.5 lakhs under section 80C of the Income Tax Act. However, ELSS is not the only investment eligible for Section 80C deduction. Other common eligible investments/expenditures include EPF, home loan repayment (principal only), child education expenses, life insurance premium and PPF. Faced with all these competing investments, people often face the question whether they should still be investing in ELSS funds even if they have exhausted their 80C limit of Rs 1.5 lakhs. The question is directly related to the performance of ELSS funds relative to other equity funds. If we find evidence that the performance of ELSS funds is better than other equity funds then it makes sense to invest in them even beyond 80C. However, if the performance of ELSS is just in line with other equity funds, then investors should only invest up till they have exhausted their Rs 1.5 lakh limit and then if needed they should invest in other equity funds. This is because ELSS funds impose a 3-year lock-in restriction on investors which are not present with other equity funds. To assess the performance of ELSS funds, it is first important to understand their cap exposure. This is because we know that smaller-cap equities have a beta of > 1 to larger-cap equities. What that means is that if large cap equities move by a certain % say x, then smaller-cap equities move by more than x. This is true both when returns are positive and when they are negative. As a result, equity funds can outperform their peers during good times (and underperform during bad times) by simply holding smaller cap companies. So true performance can only be measured once we control for the cap exposure. The most straightforward way to find out how ELSS funds figure in the spectrum of large-cap, mid-cap and small-cap funds is to look at their stated investment objective. This objective is summarised in the benchmark the fund chooses for itself. So, as a first step we looked at what percentage of ELSS funds are benchmarked to a certain equity index versus what percentage of large cap funds are benchmarked to that index. The data is in the chart below. Indices are arranged from narrow indices such as Sensex and Nifty 50 which only have the largest companies to progressively broader indices which have more and more small companies. For large- cap funds, as expected, ~50% of funds are benchmarked to Nifty 50 and Sensex and then a decreasing percentage is benchmarked to broader indices. Comparing this with ELSS funds, more % of ELSS funds are benchmarked to broader indices and less to Sensex/Nifty 50. So clearly ELSS funds as a group hold more shares of smaller companies compared to large cap funds. 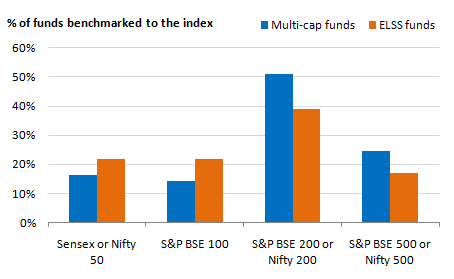 Based on this finding, we compared the benchmarks distribution of ELSS funds with multi-cap funds. Here the results are opposite. 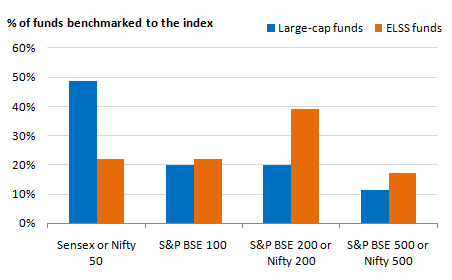 More ELSS (Multi-cap) funds are benchmarked to narrow (broad) indices. This comparison of benchmarks leads us to conclude, that based on their own stated objectives, ELSS are like multi-cap funds with a stronger tilt towards holding large cap stocks than the average non-ELSS mutual fund. Having thus classified ELSS funds as multi-cap funds with a strong large cap tilt, the next question that arises is whether ELSS funds have provided returns which are commensurate with this classification. The answer appears to be yes. Given our discussion about ELSS funds, we should expect their category returns to be higher than that of large cap funds but lower than that of non-ELSS multi-cap funds since the latter have more small stocks. The table below shows that that has indeed been the case. Performance of ELSS funds over different historical time periods has been between that of large cap and non-ELSS multi-cap funds like one should expect from the analysis of benchmarks. Our analysis shows that performance of ELSS funds is in line with other equity funds and commensurate with their cap exposure. Hence investors, who have limit left under Section 80C and who want to invest in equity funds, should definitely go ahead and invest in ELSS. However if you have already exhausted your 1.5l limit, then there is no reason for investing in ELSS. 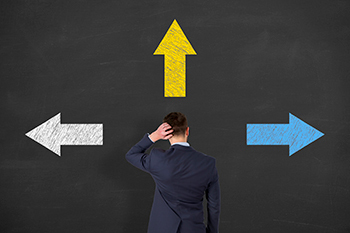 Investors are better-off investing in other equity funds where they can avoid the 3-year lock-in period. They can generate a similar kind of exposure as ELSS funds through a combination of large-cap and mid/multi-cap funds. These funds have a typical exit load period of 1-1.5 years and investors can enjoy long-term capital gains tax of 0 after 1 year of investment.